New Lanark World Heritage Site is one of 6 UNESCO World Heritage Sites in Scotland. 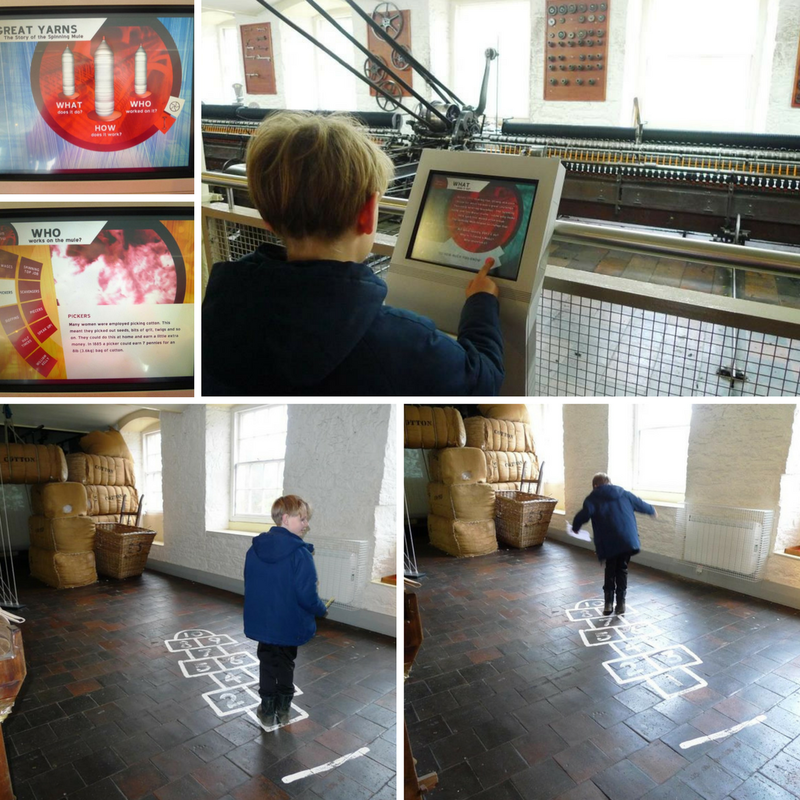 It is a beautifully restored 18th-century cotton mill located in the Clyde Valley, Just one hour south of Glasgow and Edinburgh, it welcomes over 300,000 visitors every year to experience over 200 years of social history and industrial heritage. 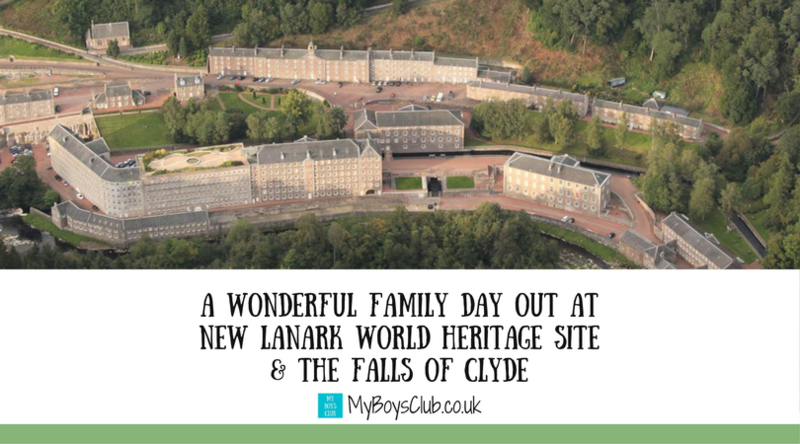 It has to be said, it is not a World Heritage Site that I had previously been aware of, but when offered the opportunity to visit and review, it caught my interest, and the combination of history, heritage, the outdoors, and the first trip to Scotland for my boys I thought would be enough to convince them too. And it was. 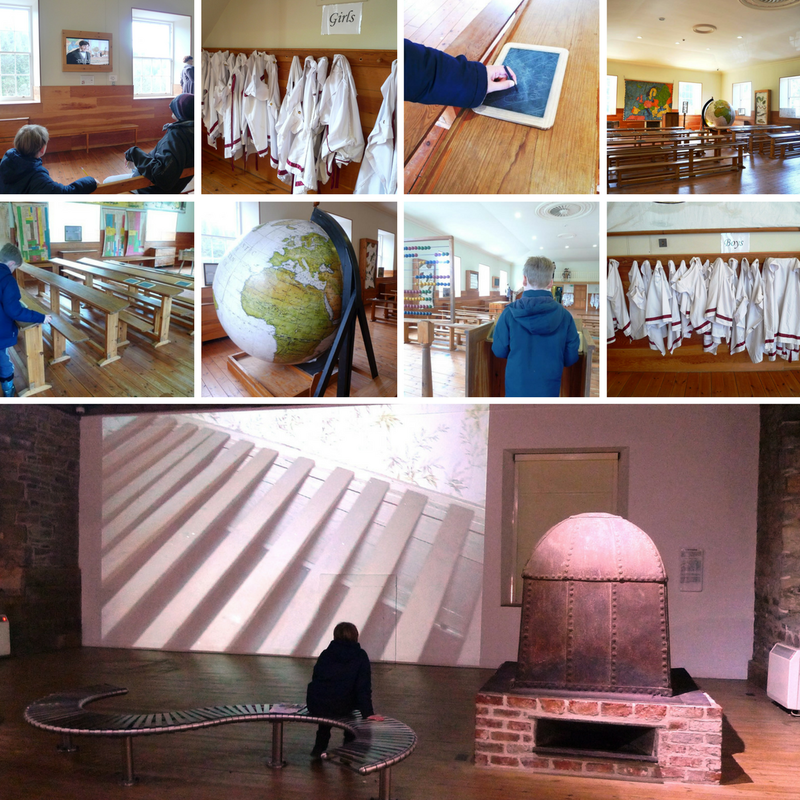 The award-winning New Lanark Visitor Centre tells the fascinating story of the cotton mill village of New Lanark which was founded in the 18th century. New Lanark quickly became known under the enlightened management of social pioneer, Robert Owen. He provided decent homes, fair wages, free health care, a new education system for villagers and the first workplace nursery school in the world. For us, it was just over a two-hour drive from Newcastle taking the A69 and M74 route. Crossing the border between England and Scotland was particularly exciting for the boys – but as it’s a motorway no stopping for a selfie here. However our return journey through the Border towns of Peebles, Selkirk and Jedburgh was nearer to 3 hours - but a beautiful journey through the Scottish and English countryside, nonetheless! On arrival, there is a large carpark above New Lanark. From here you can walk down the hill – the view is amazing as there is limited parking in the village itself. 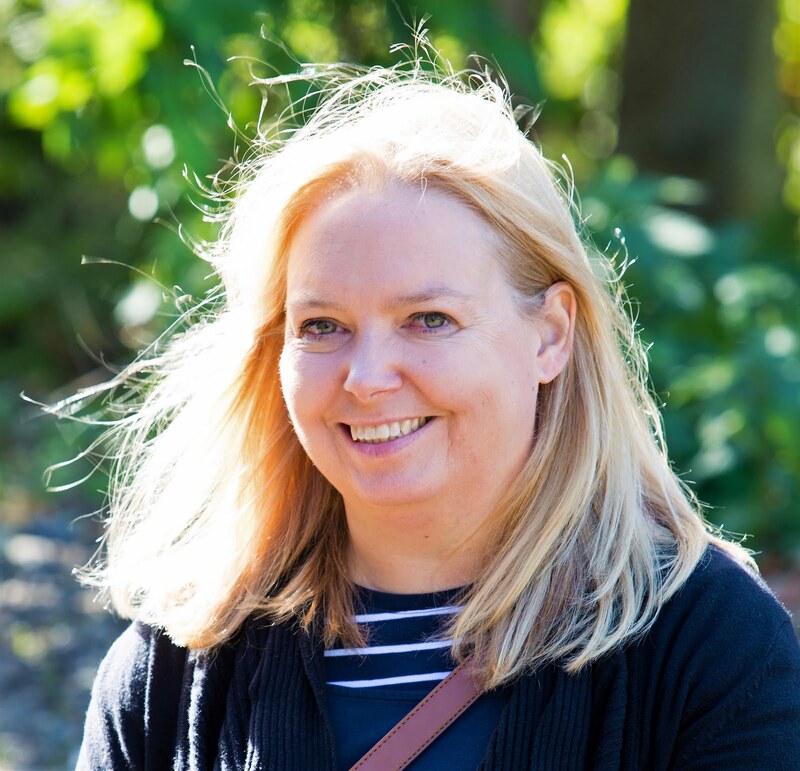 We then entered the Visitor Attraction and a very friendly staff member explained what we would be able to see and do and also gave the children an Easter Trail hunt as it was Easter Sunday. The first part of the exhibition took us through the Annie McLeod Experience. This is a ride in the dark, where two people sit in a pod suspended from a rail above, and you travel slowly through the exhibition. The journey includes sound, video, lights. 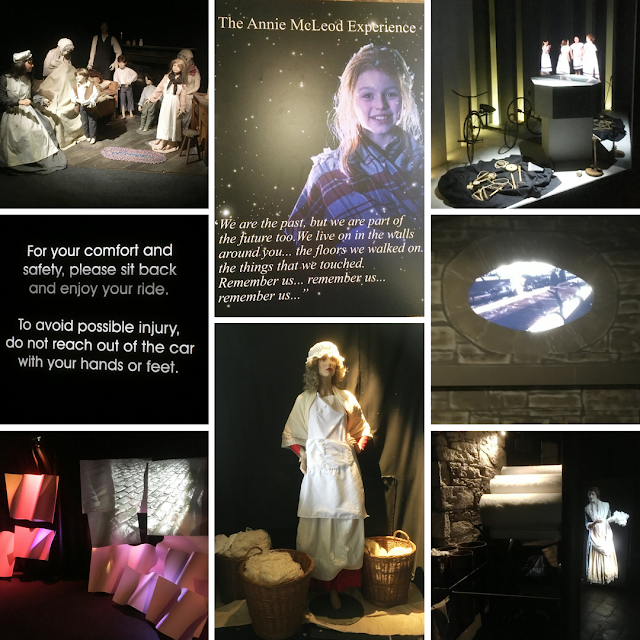 Holograms as you travel back in time and hear from mill girl Annie who magically appears and reveals the amazing story of her life and times in New Lanark in 1820. Straight from the ride the walkways then take you through the People, Cotton & Working Textile Machinery. This exhibition explores cotton productions and working conditions in the cotton industry, from the cotton fields of America to the noisy factories of the 18th and 19th century Britain. 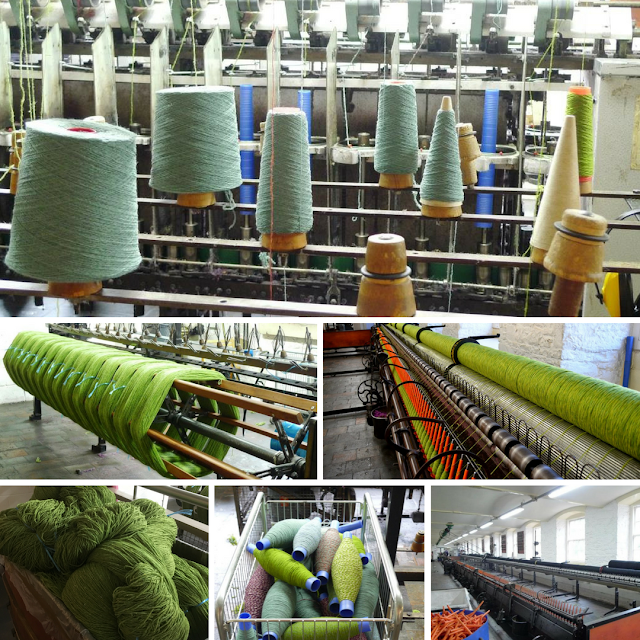 In this exhibition you can also see the historic Spinning Mule in operation, only now producing wool instead of cotton. The hopscotch on the floor and the interactive information stand really got my boys interest. 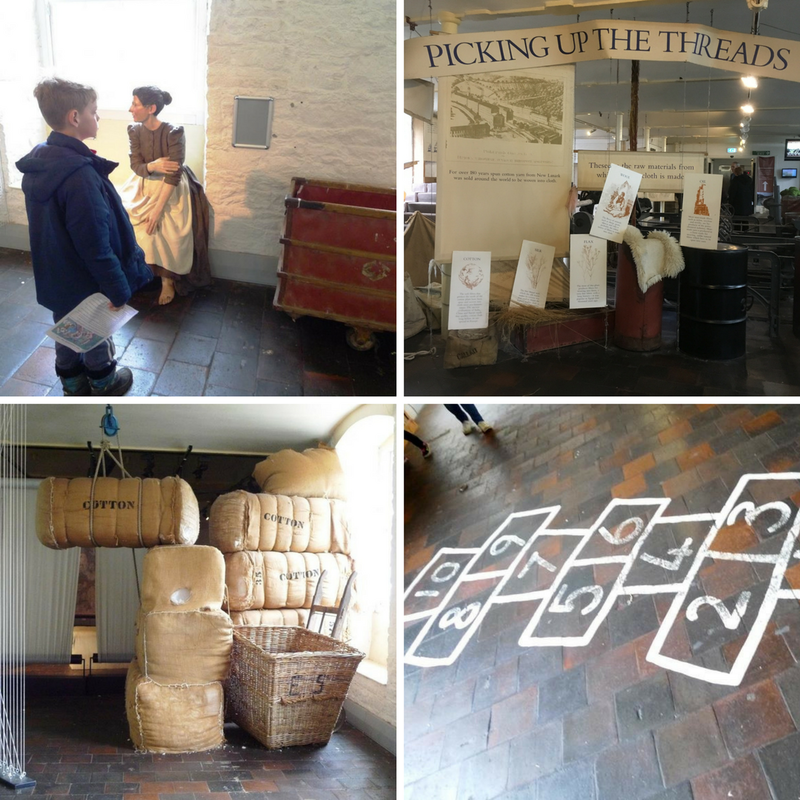 Other areas of the attraction include the School, Millworkers House, Robert Owens house and the Village Store, all of which are housed in separate buildings. At each one, you simply show your visitor ticket to be stamped. Robert Owen believed that the prime vehicle for social reform was education. Whilst at New Lanark, he created the first Infant School in the world, complete with a comprehensive education system for children. In the Historic Classroom, we discovered what it was like to go to school in Robert Owen's time. There are slate pads, globes, animal drawings, music and also the opportunity for children to dress up as schoolchildren from Annie McLeod's time, as well as watch a short film. Situated in the Schoolhouse is also the Saving New Lanark Exhibition. My eldest was intrigued and watched this film too, from beginning to end. 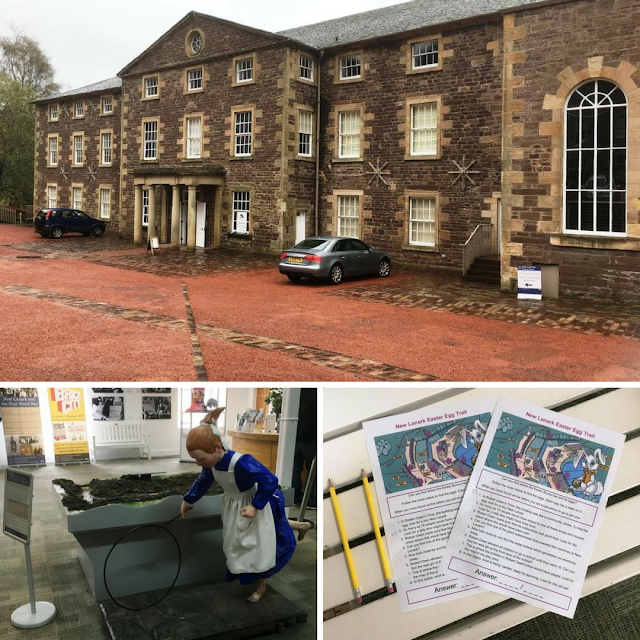 This exhibition showcases original artefacts from the village, including a selection of historic street lamps and the original weather vane as well as images that were taken before and after the restoration of New Lanark. 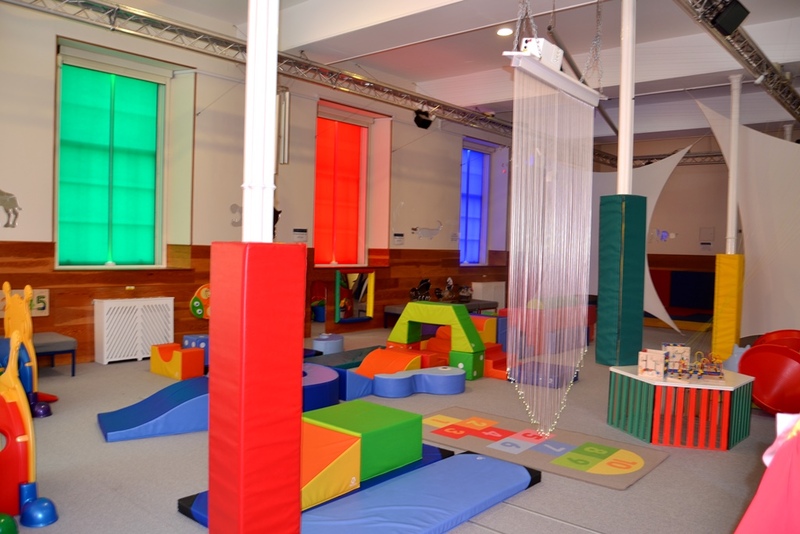 Also in the schoolhouse is an indoor multi-sensory experience of sound, light and colour. The Interactive Gallery is a 21st-century playroom which reflects Owen's progressive ideas of infant education with the themes of environment, art and music. Entry to the Interactive Gallery is £3.35 per child or £2.00 with a Visitor Ticket only on the date of purchase. This price allows playing for up to 2 hours. Under 1's go free. The Interactive Gallery is most suitable for children aged 7 and under, though so my boys didn’t get the opportunity to try it out. In these building, we saw how the villagers of New Lanark lived in both the 1820s and 1930s. I recognised kitchen bowls and utensils that my Nanna still had in her kitchen a few years back. As you would expect Robert Owens house is very different to the Millworkers. There we saw his original desk, books and elegant furniture. There is also a dressing up box for children to try on old-fashioned clothes and downstairs you'll find his kitchen and an exhibition about his ideals and influence on society not just in the UK but also America. 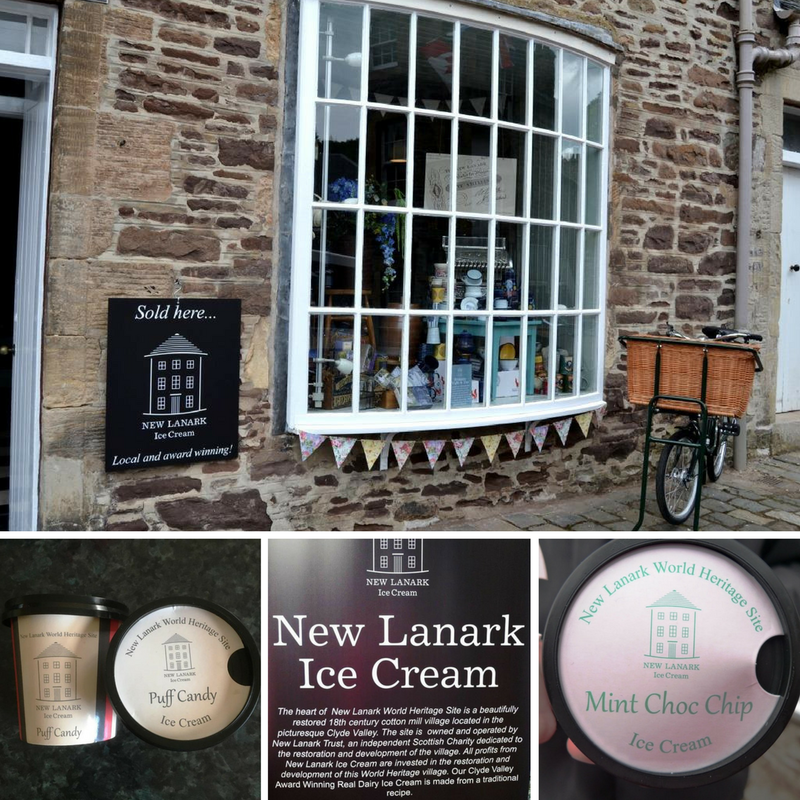 I really liked how there is a working store, where we bought delicious New Lanark Ice cream, next door to a reconstructed store. The New Lanark Village Store was established by Robert Owen in 1813, selling quality goods at cheap prices and giving customers value for money. The Village Store today offers visitors the chance to find out about shopping in the past, the development of the Co-Operative movement and Fair Trade. All was really interesting. The boys especially liked all of the information on display about the cost of goods. Annie was just 10 years old when she left school to work in the Mill. Children as young as 10 worked for 10 hours a day in the Mills. They only had 2 days holiday a year. They worked 6 days a week. They also attended school every day apart from Sunday. Small children worked in dangerous conditions crawling underneath machinery to pick up cotton. They played on a Sunday. Families of up to15 people lived in 2 rooms. Extra beds were stored under beds so everyone had somewhere to sleep. Mill workers never lived in houses where there were more rooms than people. 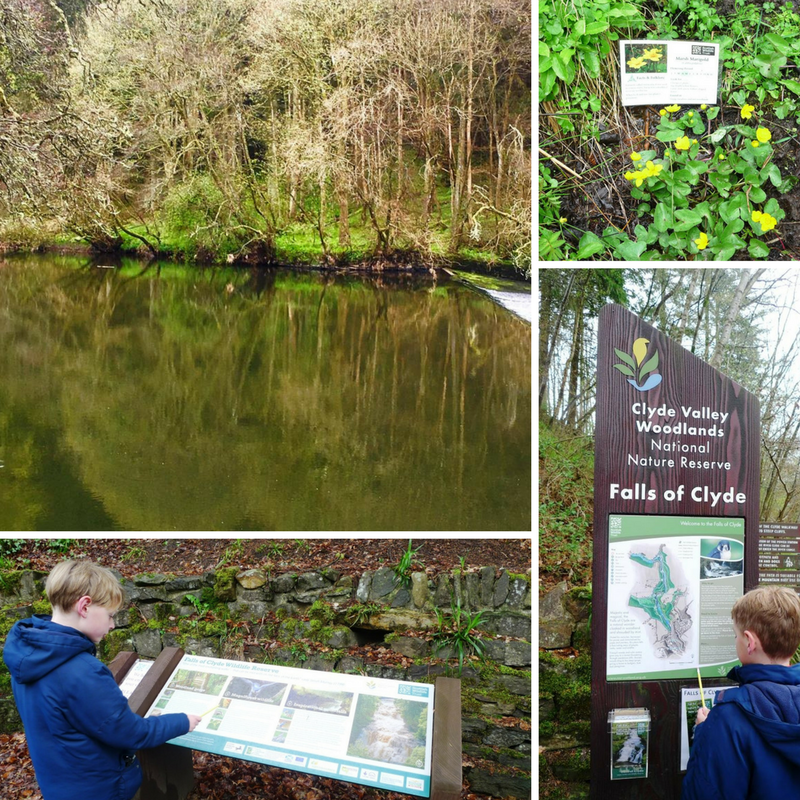 There is an outdoor playground with picnic tables but sadly for the boys, it was too wet on our visit to play there, however, we did make the most of the wildlife Walk and the Falls of Clyde. 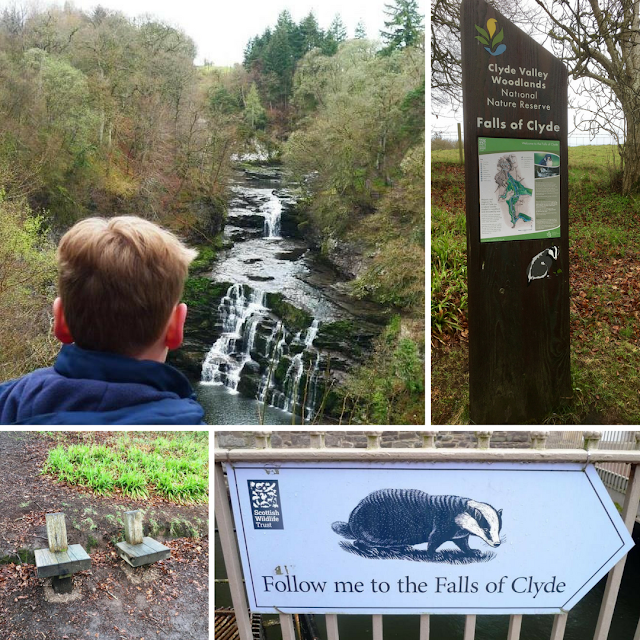 New Lanark is also surrounded by beautiful wildlife walks and is the gateway to the spectacular Falls of Clyde. Here you can walk in the footsteps of both Robert Owen and, as we would discover, William Wallace too. The Falls of Clyde comprise the upper falls of Bonnington Linn, Corra Linn, Dundaff Linn, and the lower falls of Stonebyres Linn. We didn’t see any badgers, otters or Peregrine falcons, but that is possible. But we did see the Waterfalls of Corra Linn and Bonnington Linn and Dundaff Linn. Corra Linn is the highest, with a fall of 84 feet. 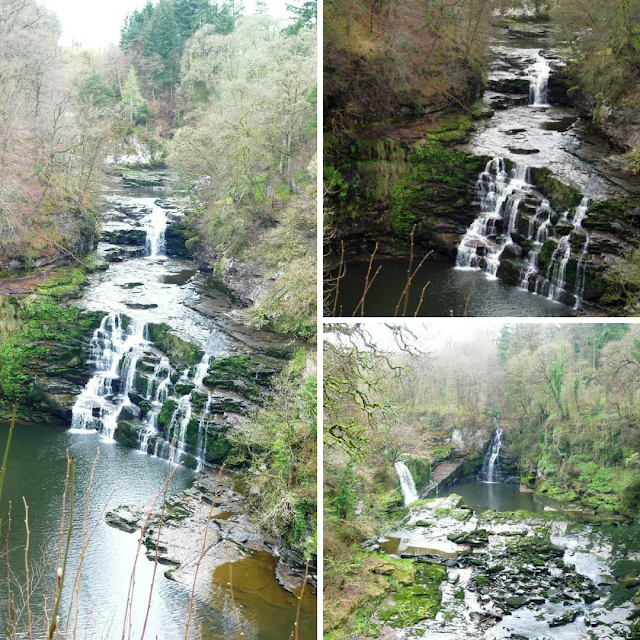 Bonnington Linn (fall of 30 feet), and Dundaff Linn (fall of 10 feet). Stonebyres Linn is located several miles downstream from New Lanark so we didn’t walk to that one. The footpaths are really well maintained with a wooden boardwalk in between Dundaff Linn and Corra Linn with information regarding the wildflowers that you can see. It’s a fair walk, some parts uphill. 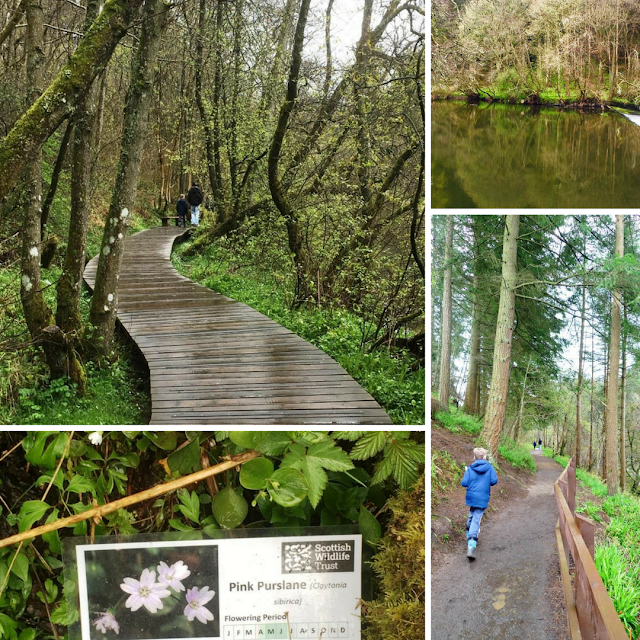 From Corra Linn to Bonington Linn it is ¾. In total during the day, we walked 6 miles so it’s well worth putting on comfy shoes. It was also raining on the day we went so waterproofs are invaluable too. 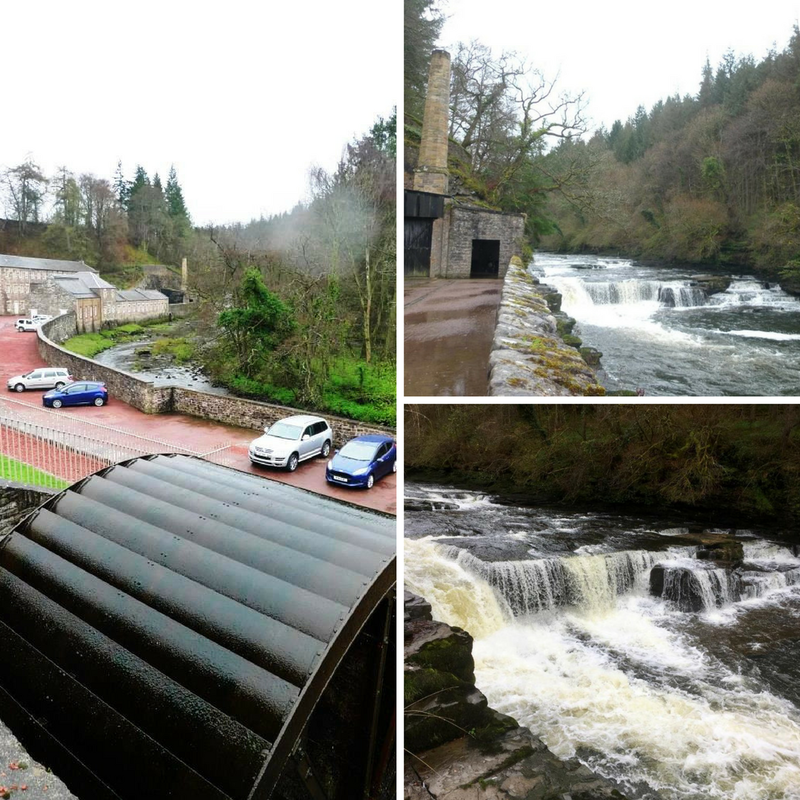 It is not surprising that many staff say that standing at the water wheel and looking at the view of Dundaff Linn is one of their favourite places at New Lanark. There is also a Roof Garden & Viewing Platform on one of the mill buildings which you can access by stairs or lift from the loom room, providing stunning views. The garden is open to visitors all year round. On the day we visited it was very wet but I can imagine on a dry day it’s a beautiful place to be. 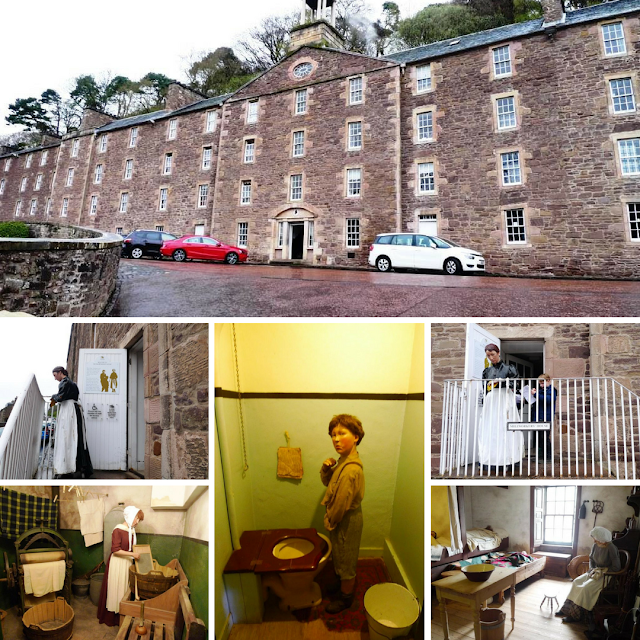 New Lanark was founded as a cotton spinning village in 1785 by David Dale. Under his son-in-law’s enlightened management it became a successful spinning centre until its closure in 1968. His son in law was Robert Owen is widely regarded as the father of British Socialism – community not political socialism. I have to admit that Robert Owen is not a historical figure that I have heard about before. He is not someone who I studied in history lessons or in politics – and I have an A’Level in Politics and a degree that covered culture and society. However, I started to out this right on the journey home reading all I could about Robert Owen on the internet. At New Lanark and while travelling home I learned that Robert Owen was important as a pioneer in the idea of a co-operative, Utopian society. He was a leader in the British Socialist movement and developed workplace changes and educational reforms, introducing arts education, adult education and early childhood education. Robert Owen was born in Wales in 1771 and was one of the most influential thinkers and social reformers of his time. At 10, he was sent to London to be apprenticed as a draper and by his early twenties, he was a successful manager in the mills of Manchester. The working conditions there appalled him. He believed that character was formed by experience and that the dreadful environment of child workers would inevitably lead to damaged and dehumanised adults. So when, in his late twenties, Owen became a partner and manager of a large cotton mill at New Lanark on the River Clyde, he decided to create a model environment. Owen set out to make New Lanark an experiment in philanthropic management. He improved the factory and village, built a school and provided a shop where quality goods could be bought at a fair price. The school curriculum included music, dancing and nature study. 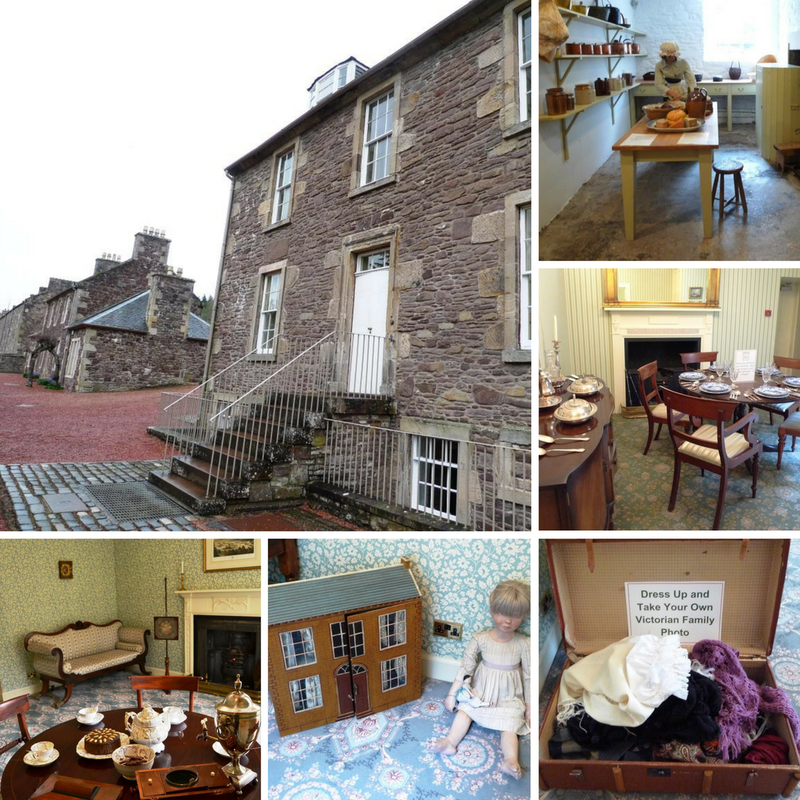 When Owen arrived at New Lanark, children from as young as five were working for thirteen hours a day in the textile mills. Owen was convinced that education was crucially important in developing the type of person he wanted. He stopped employing children under ten and reduced their labour to ten hours a day. The young children went to the nursery and infant schools that Owen had built. Older children worked in the factory but also had to attend his secondary school for part of the day. This had a real impact on me as I was visiting wth my son, soon to turn 10. The thought if him working ten hours a day and then having to attend school is just something that doesn’t even seem possible. And these were the improved conditions. We arrived shortly after 11 am and didn’t leave until the close at 5 pm as there was so much to do. We took a picnic with us however the Mill Café does have a reasonable looking menu too. New Lanark was a really unexpected experience. 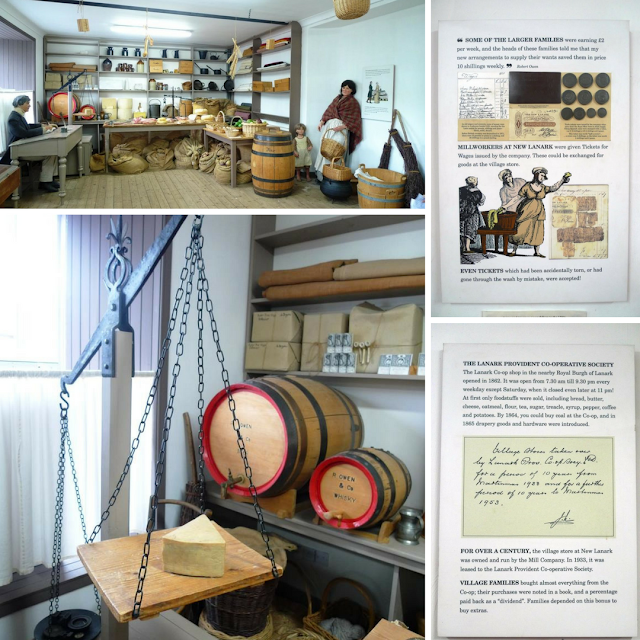 From learning about the social reforms that took place there – the attention that was given to the workers, treating them as human beings and to the children allowing them the time to play and learn. To knowing that it is still a living and working community in an amazing outdoor landscape with mesmerising waterfalls. It was a great day out, and one that even the rain couldn’t spoil. There are lots of links to resources on the New Lanarkshire WHS website. Have you been to New Lanark? Disclosure: We were invited to visit and received complimentary admission in return for an honest review. What a great snapshot of history! I love visiting places like this and learning new and wonderful things. It's so great to be able to bring kids to historical sites, in m opinion, it opens up a love of history and in some ways travel! Wow. You're right, the conditions that children had to survive under, just don't bear thoinking of. I think it's really important for children to visit historic places like this, as it's easy for them to assume everyone's lives were the same as theirs. It sounds as though New Lanark Visitor Centre have done loads to make the visit appealing and fun to families, as well as educational. Thanks for linking up with #CulturedKids. I love historic spots like this. It's like taking a trip back in time and seeing how people lived and existed in a time that we weren't a part of. The Annie McLeod experience sounds like a fun little ride, too. This place is full of mixed emotion, however it is one of the nice place to visit. Full of valuable information and history. Would be nice is visiting this place will be part of the education's curriculum. Looks like you had a fun and educational day out. I love the walk through the park too - the scenery looks stunning. I'm embarrassed to say that I lived in Edinburgh for 4 years while at University but never visited another part of Scotland. Need to rectify it sharpish! What an awesome find. 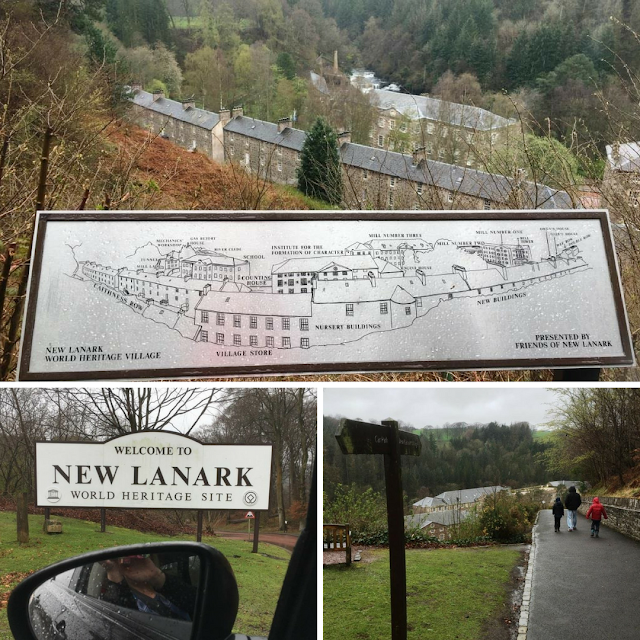 I'm planning a trip across Europe in 2019 and the New Lanark World Heritage Site will have to be on my list. I love exploring all the old places, I am from Scotland so I have been to many places similar to this and I just think they are terrific especially for the kids of today. Thanks for sharing.